Catching a glimpse of this sweet and spirited centerpiece, one can’t help but feel the happiness of the holidays! 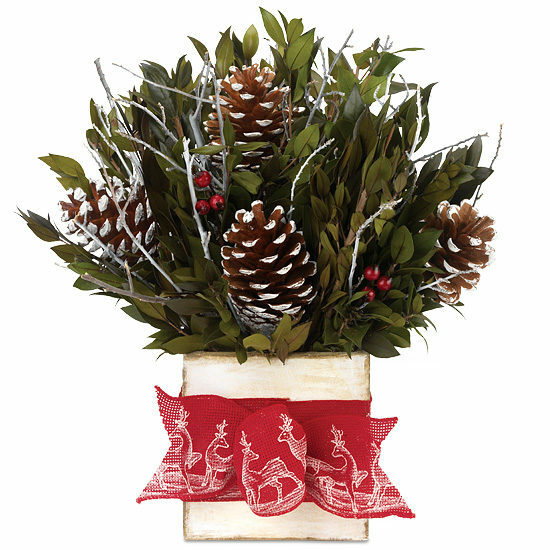 A very merry 360-degree display that’s fashioned to be festive from every side, it features preserved lime green myrtle amidst clusters of faux red berries and natural pinecones and twigs that have been delicately brushed with white to appear dusted with snow. Nestled in a square, handcrafted wooden cachepot glazed with a winter whitewash, it’s finished with a textured burlap ribbon prancing with whimsical reindeer.